If you only have time to visit one epic rail-trail in the Northeast this summer, make it Vermont’s Island Line Rail Trail—a member of Rails-to-Trails Conservancy’s Rail-Trail Hall of Fame. It’s the highlight of the region, with Lake Champlain virtually at trail users’ feet for long sections of its 13.4 miles. 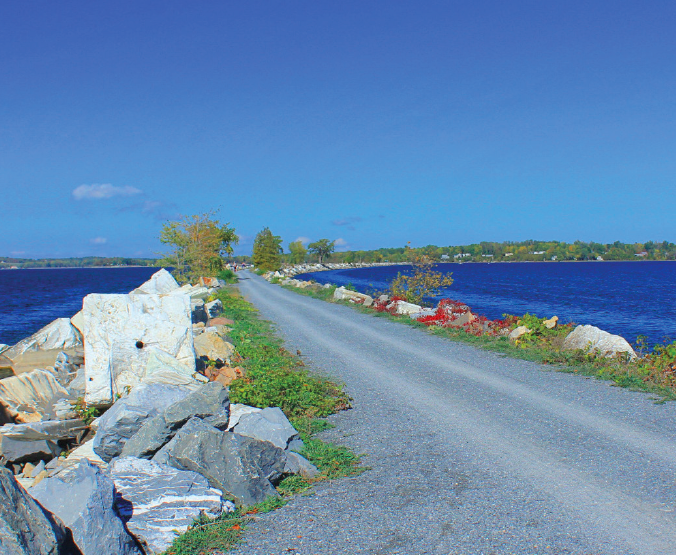 The path rolls through waterfront parks in Burlington and Colchester and crosses the lake on a 3-mile marble causeway to South Hero Island. The Rutland-Canadian Railroad built the Island Line in 1899 to connect coastal markets in New England with the Great Lakes, eventually reaching Lake Ontario. As rail transportation fell into decline, the railroad scratched its passenger service in 1955 and freight service in 1961. It wasn’t until the 1980s that the idea of a pedestrian trail took hold; now more than 150,000 visitors use the trail each year. The southern 8 miles of trail are paved, and the remainder is hard-packed crushed limestone. Since 2015, Burlington’s section of the rail-trail (known as Burlington Greenway) has been undergoing a face-lift with new paving and landscaping. You’ll notice improvements between Perkins Pier downtown and North Beach Park. If you encounter work on the trail, look for signs to the detour around the project. The southern terminus at Oakledge Park in Burlington—a good place to begin your journey—has plentiful parking and restrooms. Heading north along a sandy beach, you’ll get your first view of New York’s Adirondack Mountains across the lake. At the park’s north end, 14 granite boulders in Burlington’s Earth Clock create a calendar, clock, and compass—an example of this town’s artistic reputation. You’ll pass some industrial sites and a rail yard for the Vermont Railway, a short line railroad. Just after passing the ferry docks on King Street, you’ll see Union Station, built from brick, limestone, and granite in 1916. Used as an office building now, it’s also the base for a tourist train, as well as local bike advocacy group Local Motion. A block past the station is Waterfront Park, which can get congested if a concert or festival is scheduled. In 4.5 miles, you come to a boardwalk through Delta Park and a 600-foot pedestrian bridge over the mouth of the Winooski River. Here the trail becomes the Colchester Bike Path and Causeway. In 2.4 miles, after passing Airport Park, you come to the marble causeway that many consider the highlight of the route. American elms rise from the shoreline but don’t interrupt the view east to the Green Mountains or west to the Adirondacks. At 2.7 miles, the causeway ends at The Cut, but you can ride a ferry on weekends and holidays in the spring and fall and all week in the summer. (Find rates and hours at localmotion.org .) The trail continues for another mile once you get to South Hero Island. After getting off the ferry across The Cut, it’s another 0.4 mile to the shoreline. Here the trail becomes Allen Point Fishing Access and proceeds as a road for state fish and wildlife vehicles until it ends at Martin Road in 0.8 mile.